At Adler House Photography we realize that while planning your wedding can be exciting, it can also be one of the most time consuming and challenging tasks that you, as a couple, have faced. We would like to help make your planning a little easier by providing a list of businesses whose commitment to quality and service has impressed us and who, we feel, should be recommended. Once you set your wedding date, one of the first things to consider is your ceremony and reception location. Both of these venues book up quickly for the popular months and have a limited capacity for multiple events. Once you have selected the ceremony and reception locations, we recommend booking your photographer. Keep in mind that most photographers will be booked approximately 9  15 months in advance, especially for the more popular months of June, September and October. Class Acts provides first class, professional bands and ensembles for hundreds of ceremonies and receptions each year. Some local favorites include the JuJu Bees, Big Daddy Blue, Conspiracy and Lt. Dan's New Legs, as well as a variety of classical musicians for ceremonies and cocktails. Wedding Cake/Bakery (Book 6-9 months ahead) - So many cakes, so little time to eat them all! Enjoy your taste testing! 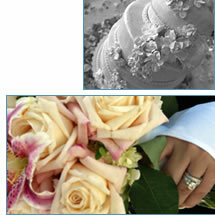 We provide this list as a service to you and those helping you plan your wedding. If, at any time, you find that one of the following businesses does not meet your expectations, please let us know.